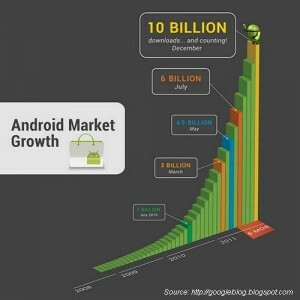 Google Android Market – Downloads Reached to 10 Billion Landmark and Counting! Its growing fast and treading over the milestone of one billion – yes, this is all about the Android Market. The number of Android applications that has been downloaded has reached to one billion per month and it is still getting ahead with the pace. Android applications has been opted by the most of the smart-phone users. If you see the graph of Android app growth you will find that from the early this years it is getting much famous with the users and users are adopting Android applications very fast. Due to enhance usability of incredible yet interactive most app popularity is getting immense. In the month of march Android app downloads reaches to 3 billion whereas in December, 2011 it gets to the number of 10 billion and counting! There is a huge speed in the people preference towards Android applications. The average Android phone owner spends 56 minutes per day using either apps or the mobile Web, with two-thirds of that time spent in apps and the remainder on the Web. So from this report it gets clear that people are loving Android applications – the way they are developed and they are amazed with the usability as well as with the interactivity. With HTC, LG and Samsung releasing new mobiles you could probably see increase in Android adopters too. So the whole new Android apps world is getting ahead with pace. You can also get ahead with the Android applications which gives you enhanced processing with flexibility. Inquire us to get the best incredible yet interactive Android applications and Games for Entertainment for your smart-phone.